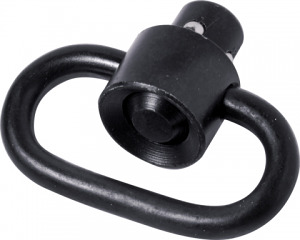 Timber Creek Outdoors AR-15 Heavy Duty Push Button Swivel. The release button on this swivel comes flush to the swivel body, virtually eliminating the chance for errant release of the swivel. Pull tested to over 300 pounds and featuring non-glare manganese phosphate finish. Manufactured by GrovTec US Inc.